Millsaps is the most wooded campus I’ve ever seen. 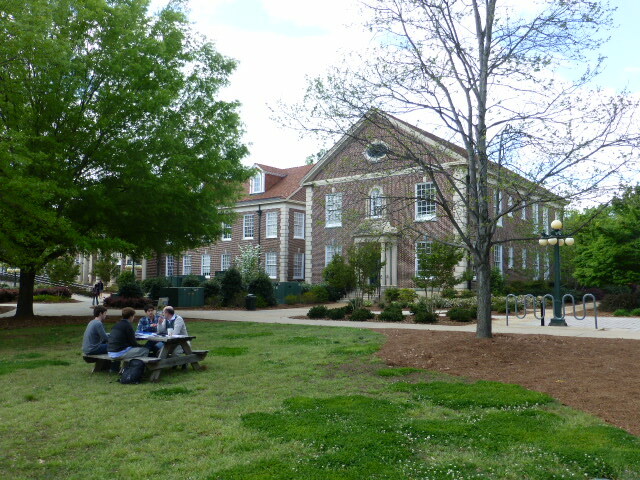 Lots of campuses have trees; Millsaps has TREES – to the extent that it’s hard to see the buildings sometimes! Seven gardens and several statues are scattered through campus. One statue is of Gandhi; students have a tradition to fist-bump him on the way to an exam if they want an A. One of the gardens has both the “M-Bench” (rumor says that if you kiss your girlfriend/boyfriend on the bench, you’ll get married) and Major Millsaps’ tomb (and yes, he’s really there. He and his wife didn’t have their own children, but wanted to be buried among the students who studied at the institution he helped to found). The campus is gorgeous and feels calm, even with students walking around. 1 of the 7 gardens; this 1 has the M Bench and Major Millsaps’ tomb. Campus is small, easy to get around, and safe. There are very few blue lights, but the tour guides don’t feel like that’s a problem. They can call 1234 from any phone on campus to get help if necessary, but they didn’t know anyone who had ever needed to call. 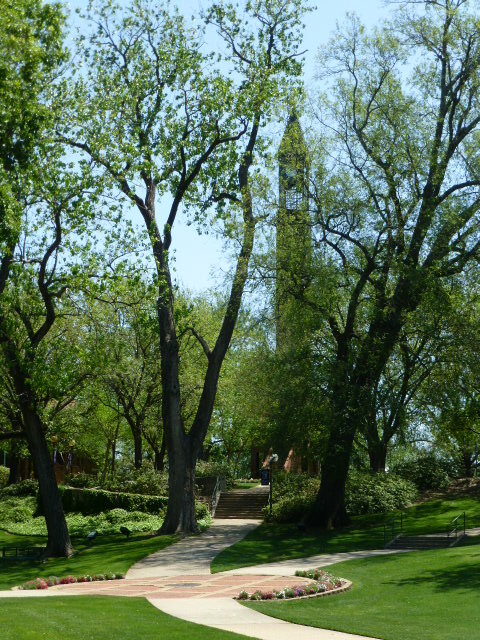 The campus landmark is the Bell Tower; there’s no bell in it, but it is wired for sound. Someone once hacked in hip-hop music that played all over campus. The three-story “Academic Complex” is the only unattractive building on campus. Students can swipe into several buildings over the weekend to work there. Both tour guides like to study in the classrooms because of the whiteboard access. The Bowl is their main quad with a large student center on one side (which houses the Post Office, Career Center, the main dining hall, a grab-and-go food station, the nurse and more). The Seal is located in The Bowl. One of the tour guide’s favorite traditions happens on the last night of Orientation (night before classes start): “Reverse graduation” welcomes freshmen into the campus community. They walk the over the seal in the opposite direction that the seniors do on graduation and they get greeted by upperclassmen and faculty. A view of a divided Freshman dorm room. Beds are on the far side of the closets. 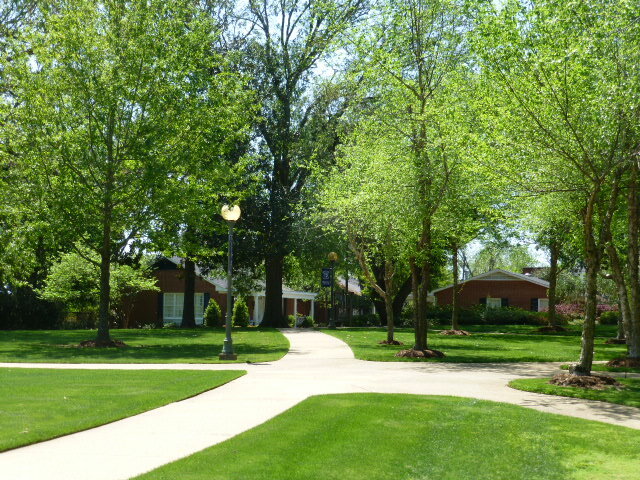 One of the freshman dorms with the courtyard where students bbq. The freshmen dorms leave a lot to be desired. All the freshmen live in these traditional cinderblock buildings. However, it’s not one of the things that the tour guides said they’d improve. “It was a bonding experience.” The nice thing about the dorm rooms was the divider in the room with the beds on one side and desks on the other which allows one roommate to sleep in relative privacy and darkness if the other one is still up working. Another nice thing is the Baco Courtyard outside the freshmen dorm with grills and other amenities. After freshmen year the students can move into suites. The admissions rep said that choosing a college is like a choosing life partner: you want to pick someone who will challenge you to be your best self but who is comfortable to be around. Millsaps works hard to be inclusive both through their mission and through their admissions process by selecting students they believe will live the mission. They’re intentional in making sure that all people on campus feel valued; one person described it as “a big hug of a school” and their welcoming attitude is seen even in the little details like adding visitor’s names to the reserved parking spots in front of the admissions office. This is one of the few colleges I’ve heard mention sexual orientation during their “diversity spiel.” One person told us that “A lot of the “–isms” are not a big deal here. People want to know: ‘Are you a smart person? Are you a good person? Are you going to help us to raise money for philanthropy?’” They’re clearly doing something right with an 80-83% Freshman-to-Sophomore retention rate over the past 10 years. Students who leave either are looking for a bigger experience (they don’t leave for a similar school) or because of family or academic reasons. Interestingly, males leave more often than females. Impressively, everyone who gets into Millsaps gets some sort of scholarship, most falling in the $10,000 to $18,000 range. The major scholarships usually go to students applying Early Action; students offered these usually score a 30 or better on the ACT (or an SAT equivalent) and a 3.9 GPA. 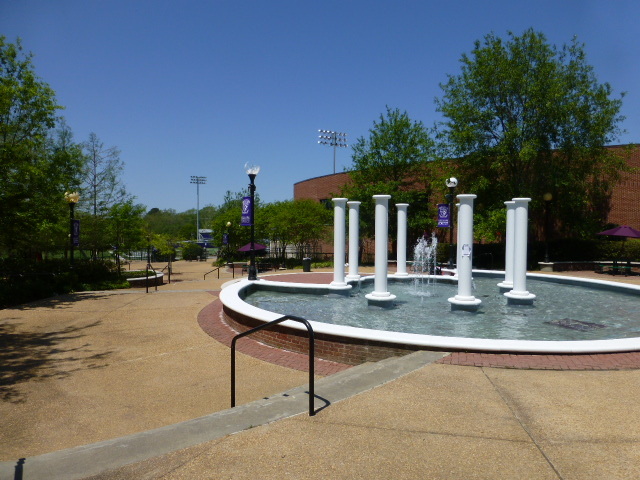 They will super-score for both the SAT and the ACT; if a student retakes the test after the scholarship decision has been made, the student has to formally appeal for Millsaps to reconsider the scholarship amount. For admissions, students can apply Early Action or Regular Decision, with a rolling cycle after that if beds are available. They look to bring in about 230 incoming freshmen and another 40 transfers. International Students only have to take the TOEFL if the scores are borderline (under 21 ACT). Campus activities are what you’d expect of a campus like this. Greek Life (6 frats and 4 sororities which have “sorority lodges”) is fairly popular and inclusive (many parties and activities like the Fashion Show are open to the community), but not mandatory to feel part of campus. Freshmen rush during the second week of classes after they’ve had a chance to settle in. Student Life Committees plan lots of typical types of events and will bring in big name speakers like Myrlie Evers. Students also take advantage of being in Jackson. The admissions staff took us to lunch at a trendy new tapas restaurant frequented by the students, and several students joined us so we had more time to get their perspectives on the school and town. They love First Thursday in the artsy rehabilitated center downtown. The reservoir about 20 minutes from campus is also popular to hang out, study, kayak, and more. A large percentage of students are active in the broader world, as well. 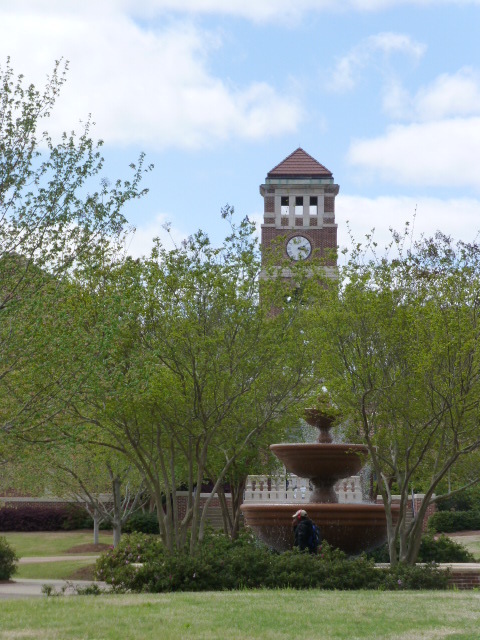 There is a stopped clock tower on campus which the students have pledged not to restart it until the clean-up from Katrina is complete, but “more hurricanes keep hitting, so it’s going to take a while.” Lots of students go on alternative spring-break trips to help the rebuilding efforts. The Millsaps athletic teams (9 DIII teams each for men and women) play in “The Brain Bowl,” in which Rhodes, Birmingham Southern, Hendrix, Sewanee, Oglethorpe, Centre, and Barry also play. Their players are “Renaissance student athletes,” and 98% of them graduate in four years. They emphasize the experience of playing over winning. About 40% of each incoming class declares intention to play, and approximately 35% actually play when they get to campus. The students say that fans rally around the football stadium. There’s a plaza with a fountain just outside the stadium which attracts people before games and hosts lots of events (activity fairs and the like). 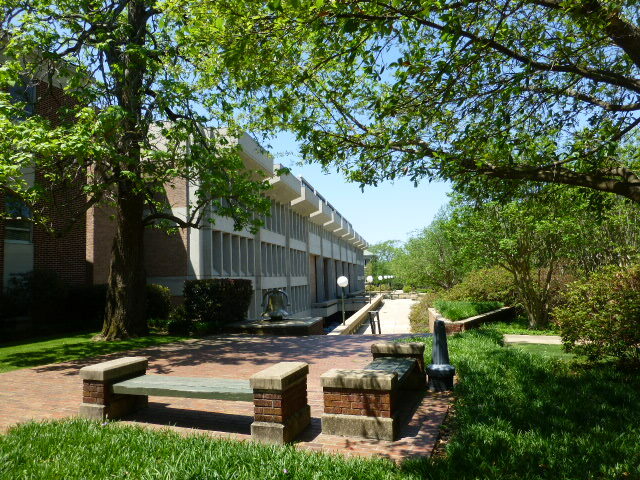 The Business building which houses one of the full fully accredited programs at at undergraduate liberal arts schools. 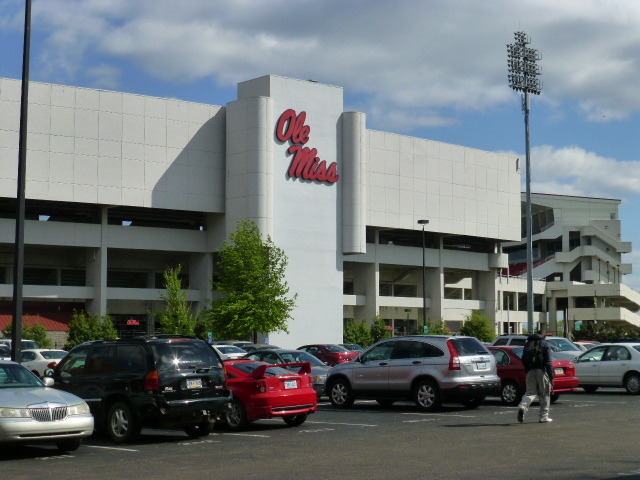 Although there’s no consortium in which students can take classes at nearby colleges (except for ROTC students who do their work at Jackson State), students can enroll in Dual Degree programs such as the 3-2 (BS) in Engineering and Applied Science with Auburn, Columbia, or Vanderbilt; a 4-2 (BS/MS) with Columbia; a 2-2 (BSN) or a 3-2 (BS/BSN) with the University of Mississippi; or a 4-2 (BS/MSN) with Vanderbilt. There is also an Honors College. Students get invited after sophomore year and complete a three-semester program in which they develop an honors thesis proposal in addition to comps and participate in a symposium at the end. About a dozen students participated this year. Finally, they also offer a Ford Fellowship in which invited students can develop a syllabus and co-teach a class. Our tour guide was a junior from Massachusetts who came to OleMiss because she was recruited for the Rifle team and is thrilled with her decision. The school spirit is intense on campus. Tailgating is a huge deal; people rush the Grove and stake out spots; it’s an all-day event, and she loves that alum will come back all the time, and she loves that she always gets to meet new people. (However, football isn’t the only sport getting attention. 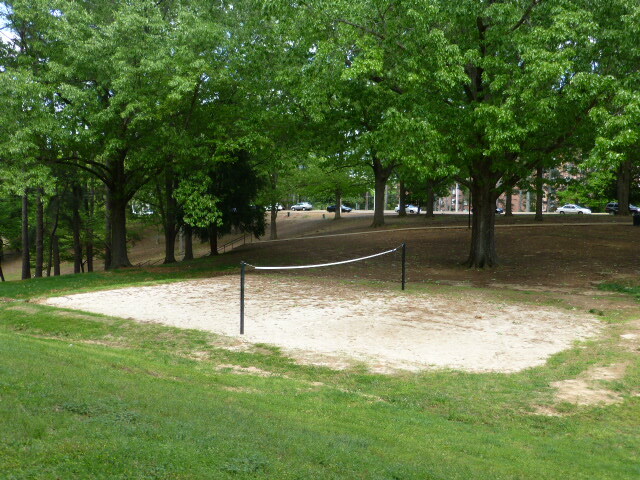 I had parked near the tennis courts, and there was a match going on – the stands were packed, and there was a LOT of enthusiasm in cheering for the players). Our tour guide also loves the other traditions on campus, including the fact that there are 25 things to do before graduating, “not all of which are technically allowed” such as jumping in the fountain. She also appreciates that you can get anywhere on campus in 10 minutes (amazing for a larger state university), but if people don’t feel like walking, they can take the shuttles that run every 11 minutes. She brought a car for her first semester (parking is $80 for the year), then took it home second semester and left it because it was more hassle than it was worth. When asked what she would like to do to improve campus, she said, “Knock down one of the older dorms and build a garage . . . oh, and get more guys!” (The freshman class is 75% women this year!). Liberal Studies: for students who want to create their own Major or combine several interests, they can complete 3 minors which becomes their Major. Center for Manufacturing Excellence: This competitive program combines engineering and business, teaching them the lingo of the other field so they can work together. Political Science and pre–Law: They have the 5th oldest law school in the country, and a HUGE network in politics (all but 5 Mississippi politicians went to OleMiss Law). Languages: Chinese and Arabic are ranked at #1.
International Studies is ranked at #7. The Croft Institute is competitive; students must study abroad and take a language in this major. Accounting offers a 5-year BA/MBA with a 100% job placement rate. Pharmacy: they have an early-admit program which is competitive. 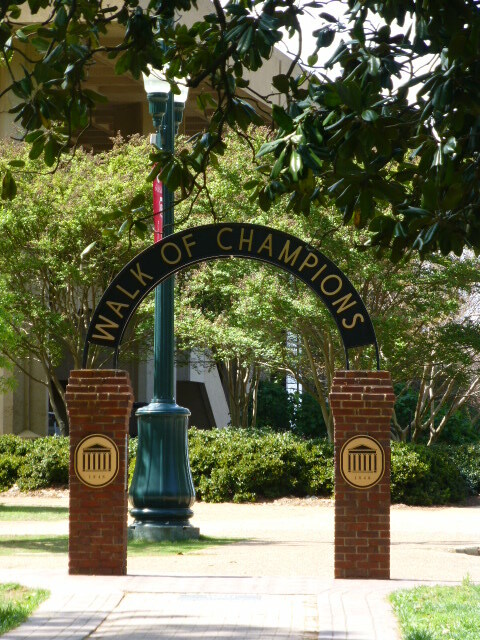 Medical professions (OleMiss has the only medical, dental, and pharmacy school in the state). 79% acceptance rate into med school. Journalism: Students in this major can specialize in anything, but they have to take classes in everything (digital media, interviewing, filming, etc). Education: Students major in their teaching area, and then spend 1 additional year getting an EDU MA. Certification reciprocity works everywhere but TX and FL. Students can apply as early as July 1 after Junior year. The application is straight-forward: no essays, no recs, no list of activities. Simply hit submit and pay the application fee. Once this is done, they’ll send an email which asks for three years of transcripts and the senior schedule (they’ll take this through Naviance/edocs, faxed, or mailed) and scores. Once the file is complete, they’ll let applicants know within a couple weeks. If you meet the basic requirements by completing the required number of high school courses (non-MS residents don’t need the Computer App class), have a 20 ACT or 980 SAT (single sitting – they do not superscore), and a 2.5 GPA, you’re in. Once you’re admitted, you can access the scholarship application. Students coming in with AP scores can get credit for 3s or better, but to guarantee credits for a specific class, get a 4 or 5. The honors college is one of the most popular programs, and is ranked #12 in the country. Entry is highly competitive: 4000 students applied last year for 300 spots. To even get LOOKED at, students need a 28 ACT and 3.5 GPA, but last year, maybe 15 accepted students didn’t have a 30 on the ACT; the average score was a 31. Once a student is identified as having the minimum requirements, they need to get recommendations and write essays. The Admissions rep also said that students need to show real involvement outside of school: “Do some REAL stuff this summer! Teach kids English, back-flip off the Empire State Building, something!” Students accepted in the program are go-getters at college, too: there have been 25 Rhodes scholars (only Vanderbilt has more from the Conference) plus Goldwater and Truman winners, among others. Freshmen must live on campus and are required to have a meal plan. Our tour guide loves the food: “you can’t go hungry!” Options include traditional dining halls, a food court with choices like Topios, frozen yogurt, Chick Fil-A, a burger place, etc. There are several tiers to the meal plans. The lowest is the Greek Meal Plan which is heavy in fall, light in spring (and recommended if you’re planning on going Greek); plans extend up all the way through the 21 meals per week. There are also several levels of living options. Residential Colleges are suite-style and the most expensive. The traditional style dorms (bathroom down the hall) is cheapest; these are cinderblock buildings with large lounges (home of Monday Night Football parties and Open Mic nights), and large laundry facilities in the basement. Although there are only about 15 machines for the whole 7-storey building, one of the guides said he’s never had trouble getting a machine. “Contemporary Housing” is in between these two, and just opened this past year. Rooms are slightly bigger and each has its own bathroom. Students have to be in a Freshman Interest Group (FIG – there are 2) or a LLC (7 of those) to live there. Each has a kitchen and several study rooms. Greek Life is big, and there are about 20 Greek Houses lining the aptly named street “Fraternity Row,” and several more houses on the other side of campus near the Residential Colleges. 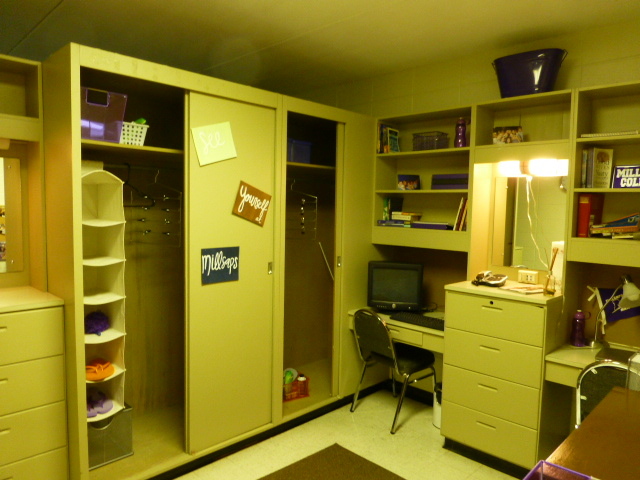 Sophomore Pledge Classes each have a floor in one of the dorms. The newer dorms are attractive and clean, and fit in with the style of some of the other buildings around campus.